"Chuck Norris & Scott Walker have a grizzly bear carpet in their offices. The bear isn't dead it is just afraid to move." The Christian Conservative Chuck Norris played the fictitious character Walker, Texas Ranger from 1993-2001 taking on crime in Dallas and corruption in Texas government. 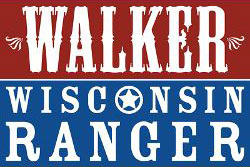 We Wisconsinites are proud to say that our native son Scott Walker, a Christian Conservative also, is a REAL "Wisconsin Ranger" who in 2011-12 took on the corruption of Wisconsin teacher unions and other Left Wing institutions determined to destroy his desire to balance our budget and reign in the political powers that be that had been hurting the hard working citizens of Wisconsin. Governor Walker bent over backwards to work with WEAC, AFSCME, SEIU and the Democrats in a reasonable manner to fix the almost 4 Billion dollar deficit he inherited by the Democrat Governor Jim Doyle. 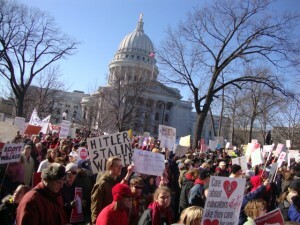 They refused to work with Governor Walker and became nuclear "mob-ocrats" as they storm trooped their way into our wonderful Capitol desecrating the interior and in ugly ad hominem fashion declared that Scott Walker was Adolf Hitler and Joseph Stalin. "Faced with presiding over the Midwest's version of California, or total stateside insolvency, Wisconsin Governor Scott Walker did what the man who played "the Terminator" in the movies didn't have the guts to do when he was governor of a state going broke. Arnold Schwarzenegger issued IOUs to the taxpayers. 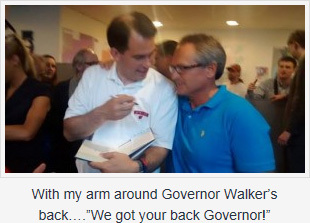 Walker took on the government sector employee unions who for too long had called the shots in state government at the expense of the taxpayers." "He [Walker] faced them down, even at the risk of his own recall, and routed them. His goal wasn't' to be a little less bankrupt, or a little less ruled by the Leftist mobocracy, his goal was to defeat them." YES, Steve Deace! Walker, Wisconsin Ranger was "UNINTIMIDATED" by the mobsters as he represented the vast majority of the people of the state of Wisconsin versus a spoiled, disgruntled, rude and crude minority who were Desperados, rebels with an unrighteous cause. After the people of the Republic of Wisconsin spoke loud and clear of their approval of our Ranger-Governor in two historic elections; a Governor who balanced our budget, put money in the bank, cut our taxes, saved and created thousands of jobs, you would think that the Democrat Desperados would have "come to their senses." They haven't. These Outlaws in tandem with the drive-by media came out last week on their high horses or better yet their jackasses with both barrels blazing as they shot up old, tired, bogus, and hackneyed charges that have been laughed at by most of the people of Wisconsin and dismissed by two Judges. Sadly too many people have not been taught to "trust but verify" or do not know how to "discern" these Democrat-Media lies as they are duped by the Friday, June 20, 2014 Washington Post headline that declares: "Prosecutor: Wis. Governor involved in illicit scheme" or the New York Times caption which states: "Wisconsin Governor at Center Of a Vast-Funding Case." I was just with Governor Scott Walker, Saturday, June 21, 2014 in Appleton, Wisconsin. As we spoke on this issue and he signed his book UNITIMIDATED for me I put my arm around his back and I said, "We are so proud of you in Wisconsin... we got your back Governor" behind me two Wisconsin citizens who were outside the standing room only meeting place for the Governor had placed in the window a Scott Walker campaign sign, where they had printed in black for the Governor to see "We got your back!" In Steve Deace's must read book RULES FOR PATRIOTS he has 10 brilliant Commandments on How Conservatives Can Win Again. Commandment #4 is "Never Surrender the Moral High Ground." Our Wisconsin Ranger Governor Scott Walker is on the "Moral High Ground" and like in the Classic movie HIGH NOON, Scott "Gary Cooper" Walker will not be intimidated by the outlaws as he fulfills Deace's Commandment #10 to "Play Offense." Our great Governor Walker's "High Noon" comes this November 4th, 2014 as he takes on desperate Democrats and Media Banditos like MSNBC's Ed Schultz, Rachel Maddow, Chuck Todd, Lawerence O'Donnell who are riding into town on their jackasses shooting lies upon lies into the crowd hoping to end our great Governor's rule of law. I want our friend Scott Walker to know that many thousands of Wisconsinites will work tirelessly to make sure that the Desperados don't prevail. Be rest assured Ranger Walker "we got your back!"